Everything you need to know about open source ERP software before you choose the right one for your company. You are about to set up an ERP (Enterprise Ressource Planning) in your company and you have chosen to set up an open source ERP software for all the advantages it offers? Or you don't yet know what type of software to choose between open source ERP software or non-open source ERP software? ERP software will be a central element of the company, so it is important to ask yourself some good questions before making your choice. The objective is to find the ERP software that suits your company, that suits the needs and expectations of the company, and that fits within the budget set by the company. What features for my ERP? Every company is different and has different needs, different processes and different objectives. The goal of implementing business management software is to improve work, optimize tasks to increase the company's productivity. Before choosing the software, make sure it can accomplish everything you need. The advantage of open source software is that it allows you to develop and add additional features to the software. But if the functionality exists as standard, it's even better! To be able to sort through all the software, it is possible to call upon an ERP expert who can tell you which software best suits your needs. You can also read this article that compares the 5 best open source ERP software. How will my ERP be hosted? Most of the software is currently online. If you are not yet used to using this type of software or if you do not have the necessary infrastructure in-house, you will have to find a service provider. The service provider can offer you to take care of the hosting himself. This is an efficient solution, you won't have to worry about the good availability of the software, someone will do it for you. You can also go directly to the editor of the open source ERP if he offers a solution hosted by himself. You can also go through a partner of the editor. He will know the product and all the specificities to guarantee a good quality of hosting and availability. The partner can also provide you with advice on the use of the software. What are the costs for my ERP? To define your budget for implementing ERP software, you must be aware that there are several types of costs. First, it is necessary to take into consideration the costs related to the software license. These are costs to be estimated according to the number of users of the software and per year. There are free open source ERP software for which this cost is not to be taken into account. In a second step, it is necessary to estimate the costs of implementing the software. This includes configuration, customization, integration and user training. These costs are to be estimated with an expert and are different depending on the software chosen and the needs of your company. And finally, it is also necessary to take into consideration the support and scalability of the software. Users will certainly need customer support (often provided by the partner or publisher). And in any case, the software will have to evolve with the company's growth to always be in line with its needs. It is therefore necessary to foresee in the long term additional costs for configuration, modification and additional developments. How to see further with my ERP software? It is essential that the software can easily evolve with the company. It is something that is easily done with open source software because it is possible to easily add modules, features, gateways. It is therefore necessary to think about this when choosing the software, and to check that the software is not frozen and that each modification is complicated to implement. The ideal is to have an ERP open source software that is modular, flexible and adaptable and that can keep pace with the growth of your company. Choosing a scalable software is the assurance of using this software for many years to come. 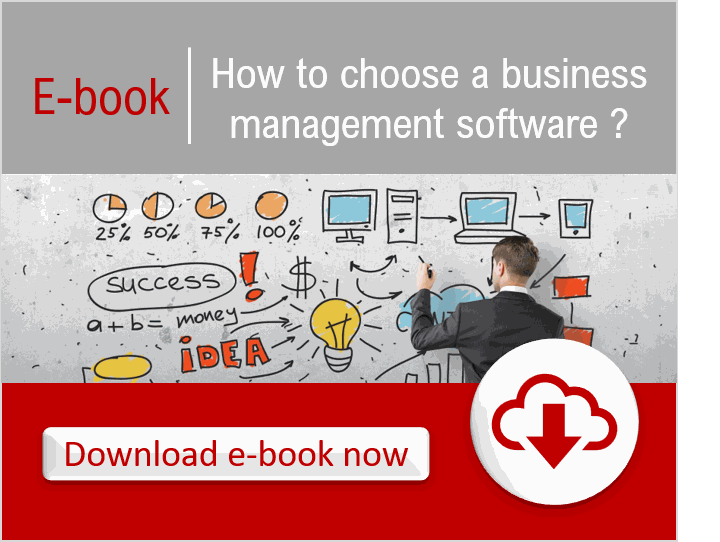 Download the guide :"How to chosse a business management software?"